If your business offerings include food services, liquor services, bars and pubs equipment, and other services that can serve the needs of pubs and bars; we can help you out! With our Bars and Pubs Executives Email List, we take you to the owners and other business professionals associated with the bars and pubs across the globe. We give you access to reach the most significant decision makers and business professionals related to the bars and pubs. These contact records are accurate, verified, and updated on a regular interval of 3 months so that the list always serves the purpose of your multi-channel marketing campaigns successfully. A good data is requisite for the success of your business. Also, the data should be compatible enough to complement the needs and challenges of your marketing campaigns. Blue Mail Media makes it easy for you. 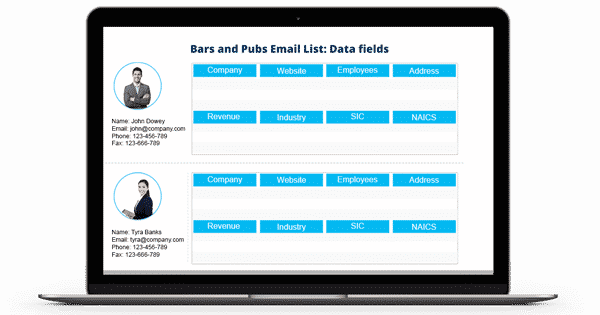 Our Bars and Pubs Mailing List is a data repository that is highly segmented, verified, and updated. Also, at every step of the data collections and segmentation, we have made it sure to comply with the Can-Spam laws both locally and internationally. You can also get this database customized as per the goals, challenges, and requirements of your multi-channel marketing campaigns.